The design of the lens standard changed from wood on the early model to metal, and the baseboard changed from wood to aluminium. The No 4 Cartridge Kodak was the first model in the series that was introduced, the No 5 Cartridge Kodak following a year later and the No 3 Cartridge Kodak appearing in 1900. Model / Variant: First model with wooden lens standard, wooden baseboard and brass metalwork. Serial Number: Serial number # 21529 stamped into front hinge line. 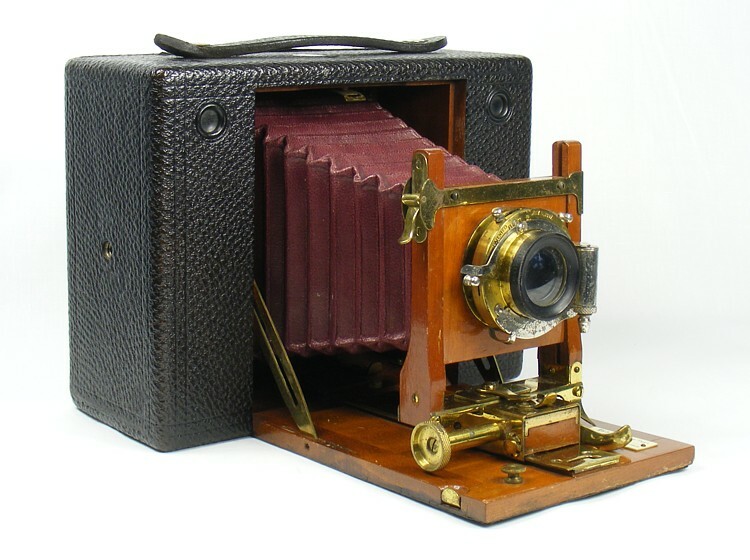 This is an early model of the No 4 Cartridge Kodak camera with mahogany lens standard and brass fittings. Serial number is 21529 (front hinge line). Coe  states that brass fittings changed to nickel in Feb 1899 from serial 21816. Compare this camera with #423, which is a slightly later Model A variant with nickel fittings on the spool holder and winder key. The leather covering is in good condition, but with a few scrapes. Handle intact, though the polished surface on the handle is coming away. A few marks to the baseboard including one gouge near the hinge line. Leather covering the opening button is dry and starting to break up - handle with care! Serial Number: Serial number # 35974 stamped into front hinge line. Another early model of the No 4 Cartridge Kodak camera with mahogany lens standard and brass fittings. Serial number is 35794 (front hinge line). Coe  states that brass fittings changed to nickel in Feb 1899 from serial 21816; comparing with #90 the obvious differences are that the internal spool holders and the winder key are nickel plated not brass and the mechanism itself is different. #90 has a separate button on the top face that forms part of the spool release mechanism. This one has an all metal sprung release mechanism. The bellows are also more tightly folded on this later model. This example of the No 4 Cartridge Kodak camera came with plate back, ground glass screen (marked as being for the No 4), 1 DDS (marked as being for the N0 4 CK or N04 BT Spcl Mod C) and 4 x 5 developing frame. Serial Number: Serial is impressed into leather on base near tripod hole but is not very distinct - looks like #74784. No 4 Cartridge Kodak camera Model E, with standard B & L RR lens. This example still has its original brown / black patterned bulb release intact, which is in good condition. Leather finish in very good condition, with only very minor surface scuffing. The camera has been very well protected by its original plain black leather case in fair condition. Metalwork is showing signs of tarnish and loss of chrome, particularly on the lower plate. The camera probably dates to 1903 as its serial (74784) is only shortly before spirit levels were introduced at the end of that year according to Coe . This example was complete with an original Model E instruction booklet "Picture Taking with the No 4 Cartridge Kodak", published by Kodak Limited. There is no date in the book. It is in fair condition (complete) but has been repaired years ago with tape and has folded edges and corners, and some tears. A common problem with the later model of the No 4 Cartridge Kodak with the aluminium baseboard is that the surface of the aluminium corrodes over time and the leather covering then separates. The rot in the aluminium can be quite severe and difficult to treat. I have had some success with stripping the leather covering away, sanding down the aluminium to remove the oxidised surface and then sealing with a good quality metal primer before re-applying the leather covering. However it is likely that the rot will return in the future. The easiest of the Cartridge Kodaks to find is the No 4 Cartridge Kodak; the larger No 5 Cartridge Kodak is not quite so common but turns up from time to time. The No 3 Cartridge Kodak is the more difficult size to find on the collectors market.